Check out my appearance on CBS’ The Insider, talking about one of my favorite groups of all time, New Edition. Please check out the mini documentary I created and wrote titled “Raiders Of The Lost Art.” It was a four part series on the making of the PRhyme album, that aired on Complex.com. Kim Osorio interviews Drake for the Source cover. Let me start by saying that it took me at least fifteen minutes to log into this page because I haven’t posted anything in so long (almost 10 months to be exact). I could have been THAT person that ran and blogged about every little thing I did but then, in actuality, I wouldn’t have much time to write (Plus, that’s what twitter is for). In between working at BET, getting married, running the kids back and forth, watching Get Him To The Greek over and over and just living…I didn’t have much time to keep this blog up to date in 2011. But I figured this was something I should record. 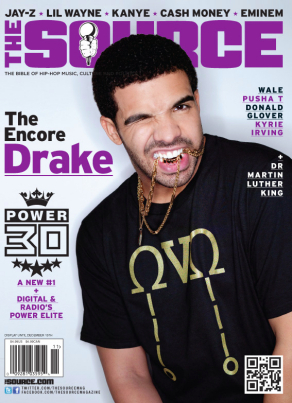 This month, The Source features Drake on the cover of its Power 30 issue. It is the first time that Drake has been on the cover and it is the first time I’ve written anything for the magazine in like, well, forever. 2005 to be exact. To put this in context, the last thing I wrote was the cover story with the Jay/Dame Roc-a-fella split. I knew if I was going to write for the magazine, that I wanted it to be something special. Especially since I left on the terms that I did. Since this cover broke online last week, there have been a few jokes about the image and Drake biting the chain. To me, that’s what the Source did in its heydey. I keep bringing up Redman with the tissue in his nose or Dre with the gun to his head. I feel like this cover is in that same vein. In most of the cover images I’ve seen of Drake, it’s been that “thinker” sort of pose. It’s cool to see him doing something different, and actually, something that seems to be out of character for him. The interview was conducted in Toronto. I flew up there with the NEW Source owner and prominent entertainment attorney Londell McMillan, Source creative director Don Morris as well as the cover photographer Mark Squires. Actually, we flew to Buffalo and drove to Toronto (even stopped at Niagara Falls and took photos). It reminded me of the lengths I would go through to get a good story. Because at the end of the day, that’s what it’s all about. Anyway, I hope that you will pick up the issue and tell me what you think of the story. He talks about his upbringing, hip-hop, his musical sound, the Big Sean one-word punchline debate, looking up to Kanye and more. I know I’m randomly posting all this stuff, but I’m trying to get it in one place. Here’s an interview I did with NYC radio station Power 105’s Ed Lover morning show. Check it out. On the red carpet at Rip The Runway 2010. Interviews with Soulja Boy, Trina, Estelle, etc.